Treat your eyes to a full colour TFT screen! Display pictures, corporate advertisements, screen savers and much more on the color screen of the terminals. With the option of TCP/IP, RS485 / RS232, USB flashdisk, or even WiFi (upon request), syncing your terminal is even easier than you think! Give your staff some flexibility by allowing them to report their attendance status by simply punching in a 2-digit code into the terminals. With the latest precision algorithm, fingerprint scanning does not only become quicker and more accurate, but it can also hold up to 12,000 fingerprint templates and 200,000 transaction logs. Although its recommended that you use fingerprint verification for more authentic attendance and access control functions, the terminals also offer options for you to verify using a card or password, or even a combination of the two! 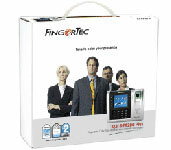 Copyright © 2012 FingerTec Worldwide Limited. All rights reserved.